Blazer was accused by Austin of "gross misconduct of duty and judgement"
Concacaf has suspended its acting president Lisle Austin as the fallout from the Fifa corruption row continues. 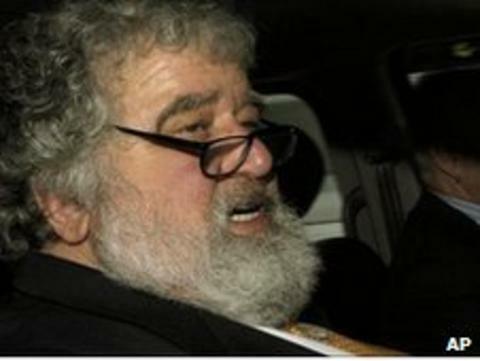 Austin tried to sack Concacaf general secretary Chuck Blazer after his bribery claims against Fifa executives Jack Warner and Mohamed Bin Hammam. But Concacaf said Austin did not have the authority to take this action. It has suspended him from football duties effective from 2 June and asked Fifa to extend the ban to ensure it applies worldwide. Austin, from Barbados, has been deputising for Warner after the Trinidadian's suspension by Fifa. Concacaf, the continental governing body for football in North America, Central America and the Caribbean, said on its website that vice-president Alfredo Hawit, from Honduras, would replace Austin as an interim measure. "Lisle Austin has been provisionally banned from all football activities within Concacaf and at the national level by a majority of the Concacaf executive committee members for apparent infringement of the Concacaf statutes," a statement said. Austin became embroiled in a public spat with Blazer following the American's claims that Warner and Bin Hammam had paid Caribbean delegates $40,000 (£24,250) each to vote for Bin Hammam in his failed bid for the Fifa presidency. Both deny the allegations but they have been temporarily suspended by Fifa pending the outcome of a full inquiry. Blazer subsequently reported Warner for breaching the terms of his suspension by urging Caribbean Football Union (CFU) members to vote for incumbent Sepp Blatter in last Wednesday's Fifa presidential elections. This prompted Austin to describe Blazer's actions as "inexcusable and a gross misconduct of duty and judgement". He also said the American was no longer fit to hold the post. Austin has until 13 June to appeal against the provisional ban, and will face a hearing on 13 July. Blatter ended up standing as the only candidate in Fifa's presidential election and was duly re-elected for a fourth term, receiving 186 of the 203 votes cast.